The allegations of ‘Russian meddling’ only make sense if they’re put into a broader geopolitical context. Once we realize that Washington is implementing an aggressive “containment” strategy to militarily encircle Russia and China in order to spread its tentacles across Central Asian, then we begin to understand that Russia is not the perpetrator of the hostilities and propaganda but the victim. The Russia hacking allegations are part of a larger asymmetrical-information war that has been joined by the entire Washington political establishment. The objective is to methodically weaken an emerging rival while reinforcing US global hegemony. Try to imagine for a minute that the hacking claims were not part of a sinister plan by Vladimir Putin “to sow discord and division” in the United States, but were conjured up to create an external threat that would justify an aggressive response from Washington. That’s what Russiagate is really all about. Washington has many ways of dealing with its enemies, but none of these strategies have dampened the growth of its competitors in the east. China is poised to overtake the US as the world’s biggest economy sometime in the next 2 decades while Russia’s intervention in Syria has rolled back Washington’s plan to topple Bashar al Assad and consolidate its grip on the resource-rich Middle East. That plan has now collapsed forcing US policymakers to scrap the War on Terror altogether and switch to a “great power competition” which acknowledges that the US can no longer unilaterally impose its will wherever it goes. Challenges to America’s dominance are emerging everywhere, particularly in the region where the US hopes to reign supreme, Asia. 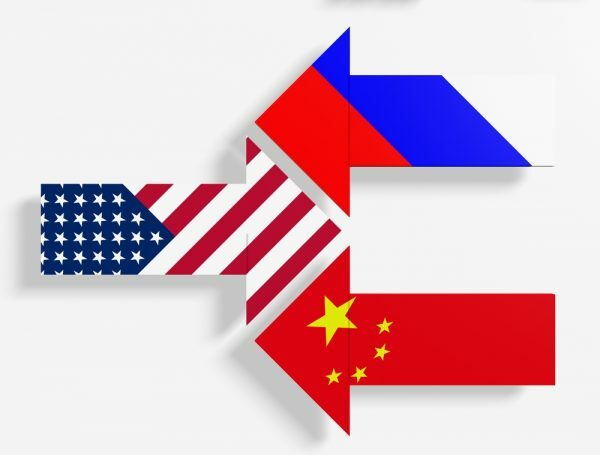 “Russia has violated the borders of nearby nations and pursues veto power over the economic, diplomatic, and security decisions of its neighbors…..
Why? Because they are successfully implementing their own development model which is NOT programmed to favor US financial institutions and corporations. That’s the whole thing in a nutshell. The only reason Russia and China are a threat to the “rules-based system” is because Washington insists on being the only one who makes the rules. That’s why foreign leaders are no longer falling in line, because it’s not a fair system.